I Have a Hashtag For That! When you look at this picture, what do you see? A weed? Or an opportunity for a wish? Have you heard any of these comments? "Why should I take the time to learn this when it will change in a couple of months?" "Oh great, something else to learn...I'm just going to sit this one out and let everyone else figure it out." "Here's something new, but another one will come along so I'm just going to stick with what I know." Whether brand-new-out-of-college or a veteran teacher, I'd be shocked if you hadn't heard one or all of these things muttered at some point during recess duty, in the teacher's lounge, a PLC meeting, or throughout the course of the day. This left me wondering why are people so hesitant to change. Is it the unknown? Is it the loss of control? Do you not feel supported by peers or administration throughout the experience? Is it easier to do what you've done because you are comfortable with that routine? Is it the fact people focus on what they have to give up, instead of what they have to gain? I can and do empathize completely with feeling that the learning curve is constantly changing. And, I can't help but reflect on my personal journey and how I've responded to change throughout my years in education. 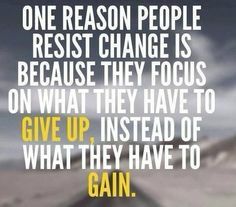 How effective would I be if I didn't embrace change on the daily? I don't know about you, but I use EACH one of the items (but one) in the above list nearly every day and multiple times throughout the day. Just to clarify in case you are wondering, haha, I couldn't tell you my login and password to MySpace if I had to. (I actually tried while typing this blog post...and no dice.) It's long become an irrelevant option. So, what are you doing to keep relevant in your classroom, your role in education? Are you slowly becoming like MySpace and becoming outdated? What if I'd stayed stuck in the rut of how I learned to teach technology 10 to 12 years ago when I started my edtech master's? Believe me, I get it! There is something to constantly learn, something to constantly figure out how to integrate into your daily educational life. Some is in fact garbage and not appropriate. 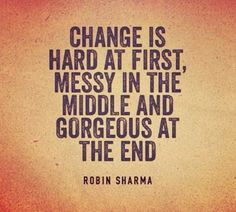 But, for those things that are wonderful nuggets, but may require you to get a little messy, are you open to that change? What if I wasn't open to evolving in my role and sunk my feet into the belief that I should continue to teach the way I'd been taught in my edtech master's program? Kodak EasyShare cameras were all the rage and I remember having an evening class where we checked out a camera and went about the campus learning how to use it. For another assignment, I created a resource for new students to our school. It was a paper flip book with pictures of our school personnel and their respective role. When I say flip book, I don't mean the app either. I mean I printed each page on the color printer and bound it together by a spiral binding machine. Another memory is having to drive 30 minutes to campus to turn in a 3-ring binder which had my "ideal" classroom design and my portfolio. Truth be told, I tried to shuffle through the boxes of old papers (yes, I tend to hoard things) to find my projects and share some snapshots of my work, but to no avail...maybe later in this IMMOOC. In the moment, I didn't feel slighted or that I wasn't provided the best experience possible. My college program prepared me for my degree the best they could with the learning exposures to which they had access. I felt current and relevant in that moment. However, can our students say that now? With the explosion over the last ten years of options, our learners are the ones who suffer if we stay stuck. Stepping to the challenge and meeting them with learning options which will prepare them for TODAY, not just tomorrow is imperative. Why play a chess match waiting out our learners because our mindset isn't open to change? Moments are lost, time is lost, and our learners are ill prepared for the cliche "real-world." If we aren't growing and changing, we are preparing them for a world that once was, not for what is or what will be. Whether you have more of a mindset to cannonball into the pool of change or you are more cautious and dip your toe in the water little by little, my hope for our learners is that you aren't sitting in the car outside the pool, looking at the dandelions, and wishing you had some weed spray. I love that graphic. 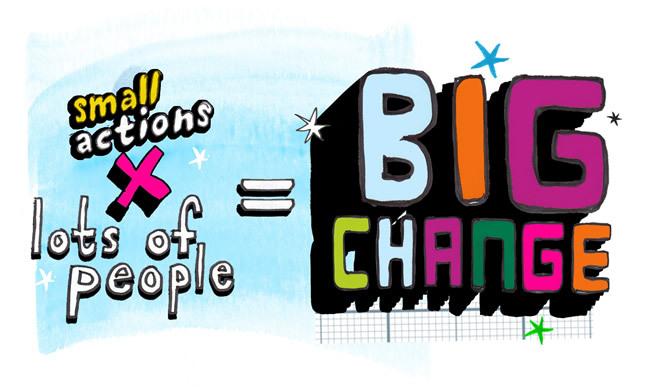 Small actions x lots of people = big change. I remember the EasyShare, and he Sony cameras that recorded pics on floppy discs. So much has changed, we've gotta change with it. I thought I was ahead by using Twitter, but now that is old news. What is next? Is it new? Is it better for kids? What a great post! You must have been listening to the teachers in the lounges at the schools where I am a technology integration specialist! My philosophy is that we are teaching skills...the mode will change, but many times the skills don't change all that much. Thanks for sharing!